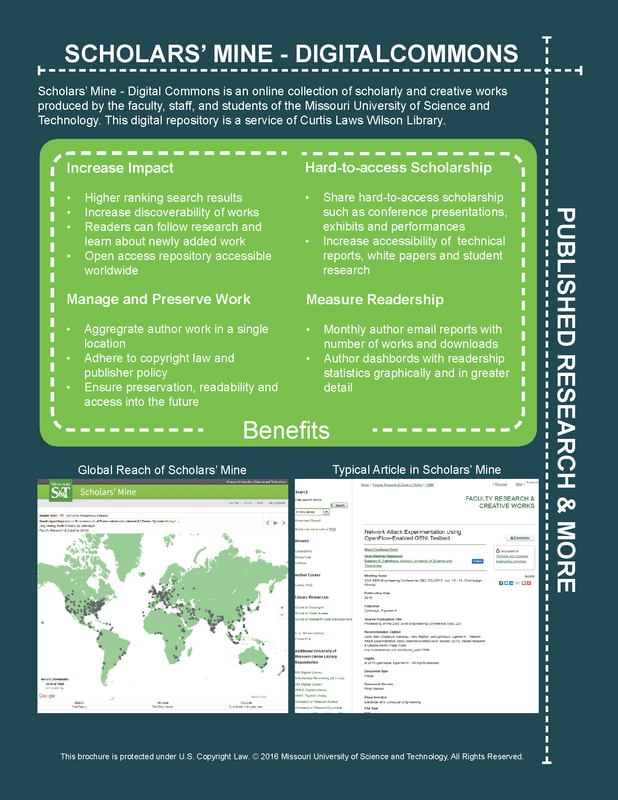 This page contains policies, procedures, workflows, guidelines, promotional materials, and other content related to the management and operation of Scholars' Mine. Best practices for producing audio files for ingestion in to Scholars' Mine. Best practices for producing image files for ingestion in to Scholars' Mine. 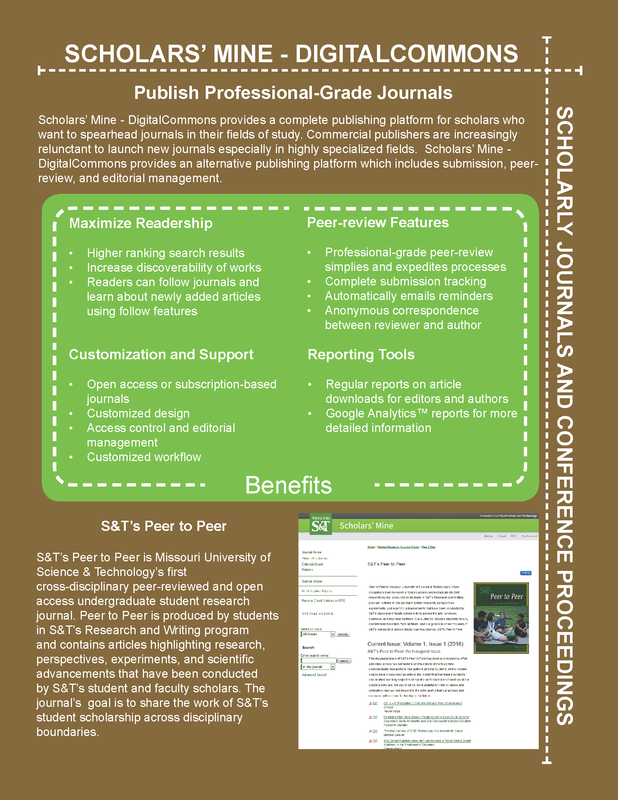 Best practices for producing PDF files for ingestion in to Scholars' Mine. Best practices for producing video files for ingestion in to Scholars' Mine. The purpose of these guidelines are to provide recommendations and support as to appropriate file types to use when submitting files to Scholars’ Mine for long-term preservation and access. The purpose of this policy is to define the types of content that Scholars’ Mine will accept and any additional acceptance requirements. The purpose of this policy is to define the parameters of access and use for digital content housed in Scholars’ Mine the institutional repository for the Missouri University of Science and Technology. This policy provides guidance for content selection for our institutional repository (Scholars’ Mine). The purpose of this policy is to anticipate and meet the research support and information access needs of our campus community. The objective of this policy is to enable the Library to legally post materials on the open web and to take the necessary steps preserve the materials (preserving the material might mean that the files will need to be converted to a different or newer version of a file format if the existing file format or the hardware/software needed to read it becomes obsolete). This policy is subject to change as capabilities, standards, best practices and technology impact the Library's ability to preserve these resources. The objective of this policy is to define how Scholars’ Mine is governed and managed. 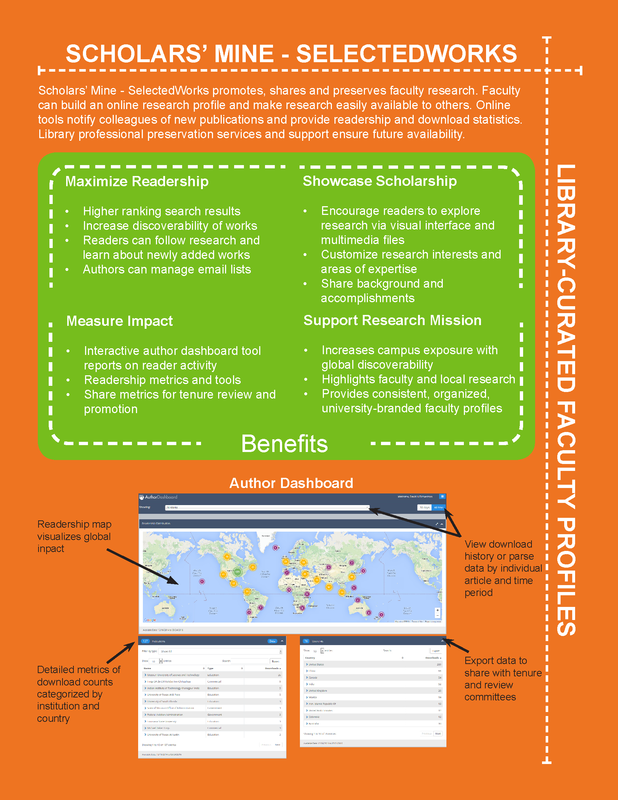 In the daily operation of our repository (Scholars’ Mine), Curtis Laws Wilson Library (Library) collects personal information about content contributors. This policy outlines how this information is preserved, managed, and protected. The protection of research subjects and the adherence to ethical norms are critical to responsible science. This policy outlines the actions and practices employed by Curtis laws Wilson Library (Library) to minimize disclosure risks, and to maintain the trust of those agreeing to have personal/sensitive data stored in the institutional repository (Scholars’ Mine). This policy supplements our existing Digital Preservation Policy by describing needs and strategies specific to preserving research data. Collection specific strategies for the continuous preservation of research data will be developed in conjunction with this policy. This policy is subject to change as capabilities, standards, best practices and technology impact the Library's ability to preserve these resources. The objective of this policy is to define the circumstances under which content can be removed from Scholars’ Mine and the associated process for removal. 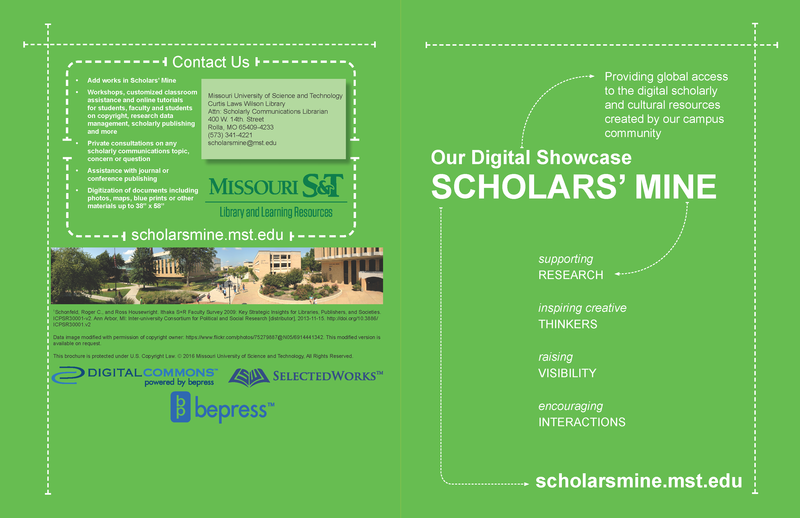 11x17 single fold brochure summarizing Scholars' Mine. This can be used as a binder for the focused single sheet brochures. 11 x 17 single fold brochure summarizing Scholars' Mine any all the 8 1/2 x 11 flyers. 8 1/2 x 11 flyer on Digital Commons. Can be included in the Our Digital Commons - Scholars' Mine binder. 8 1/2 x 11 flyer on Research Data. Can be included in the Our Digital Showcase - Scholars' Mine binder. 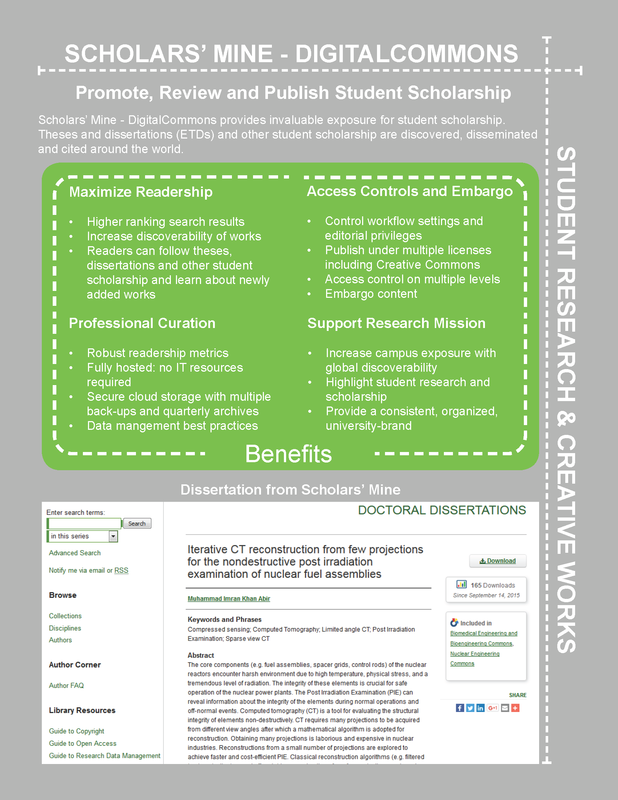 8 1/2 x 11 flyer on Scholarly Journals and Conference Proceedings. 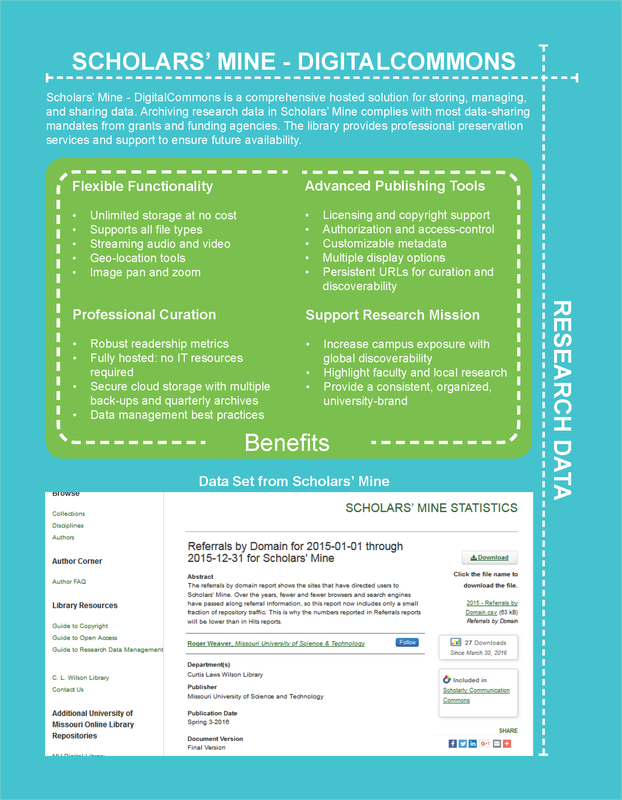 Can be included in the Our Digital Showcase - Scholars' Mine binder. 8 1/2 x 11 flyer on SelectedWorks. Can be included in the Our Digital Showcase - Scholars' Mine binder. 8 1/2 x 11 flyer on Student Research and Creative Works. Can be included in the Our Digital Showcase - Scholars' Mine binder. This workflow outlines to major processes performed to ingest publications harvested from other digital sources. This workflow outlines the major processes performed to ingest manually submitted publications. This workflow outlines the major processes performed to ingest research data.